One of them may be suitable for you. Get job descriptions, learn about training requirements and find out how much you can earn. Boilermakers manufacture, install and fix boilers which are used to generate electric power or provide heat to buildings. They also make, install and repair tanks and vats which are used to store chemicals, oil, and liquids. If you want to become a boilermaker, you can do a four- to five-year apprenticeship that combines classroom with on-the-job training. You will be paid while you learn. Boilermakers earned a median annual salary of $60,120 in 2015. Those who worked part-time earned median hourly wages of $28.90. Carpenters build, assemble, install and repair fixtures and structures that are usually made of wood. They also work with other building materials including drywall, fiberglass, and plastic. If you want to work as a carpenter, you can do a three or four-year apprenticeship that is sponsored by a trade union. Alternatively, you may begin your career as a carpenter's helper and receive your training through that job. You must also pass the Occupational Safety and Health Administration's (OSHA) 10 and 30-hour safety courses. In 2015, carpenters earned a median annual salary of $42,090 and median hourly wages of $20.24. Construction helpers assist construction trade workers. They do basic tasks and keep work areas neat and clean. Their work is limited to doing simple jobs and therefore they aren't required to have a lot of training. They will learn what they need to on the job. Construction helpers, in general, earned a median salary of $28,510 annually or $13.41 per hour in 2015, but compensation varied by trade. Electricians install, maintain and repair buildings' wiring and electrical components. While they can specialize in maintenance or construction, many work in both areas. Aspiring electricians receive training through four-year apprenticeship programs that combine paid on-the-job training with classroom instruction. Regardless of where you work, it is very likely you will need a license. Most states require one. Electricians earned a median annual salary of $51,880 or an hourly wage of $24.94 in 2015. The initials H-V-A-C stand for heating, ventilation, and air conditioning. HVAC technicians install, maintain and repair these systems, as well as refrigeration systems. The most common way to prepare for this occupation is to attend a six-month to two-year program at a trade or technical school. Upon completion, you will receive a certificate or associate degree, depending on the program. Alternatively, you can do a three- to five-year apprenticeship during which you will receive paid on-the-job training as well as classroom instruction. In 2015, HVAC technicians earned a median salary of $45,110 per year or hourly wages of $21.69. Plumbers install and repair pipes that carry water or gas. If you want to enter this field, you will have to do a four- to five-year apprenticeship. It is likely you will need a license issued by the locality in which you want to work. Plumbers earned an annual salary of $50,620 in 2015. Reinforcing iron and rebar workers support concrete used in construction with iron bars (rebar), mesh and cables. Like most construction trades, you can train for this one by doing an apprenticeship that can last from three to four years. Certifications are available in welding, crane signaling, and rigging. They may increase your ability to get a job. Reinforcing iron and rebar workers earned median annual wages of $48,010 or $23.08 per hour in 2015. Construction project managers, sometimes called construction managers, oversee construction projects. They hire and supervise specialty trade contractors such as carpenters, electricians, and HVAC technicians, among others. They usually advance after spending years working in specialty trades. 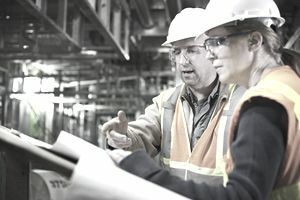 Many employees prefer to hire prospective construction project managers who have bachelor's degrees in construction science, construction management, building science or civil engineering. Construction project managers, in 2015, earned a median annual salary of $87,400 or median hourly wages of $42.02. Bureau of Labor Statistics, U.S. Department of Labor, Occupational Outlook Handbook. Boilermaker 4- to 5-year apprenticeship none $60,120/yr. or $28.90/hr. Carpenter 3- to 4-year apprenticeship none $42,090/yr. or $20.24/hr. Construction Helper On-the-Job Training none $28,510/yr. or $13.41/hr. Electrician 4-year apprenticeship License required in most states and municipalities $51,880/yr. or $24.94/hr. Reinforcing Iron and Rebar Workers 3- to 4-year apprenticeship none $48,010/yr. or $23.08/hr.